Write It Down: "The Pen Is Mightier, Than The Pink"
"The Pen Is Mightier, Than The Pink"
Grade seven was one of my memorable school semesters. In addition to the uncomfortable times that occurred during that period: Fortunately there were uplifting periods. One dreary afternoon on Friday, April 15, 2005, my dad was upstairs having a conversation with our neighbor. 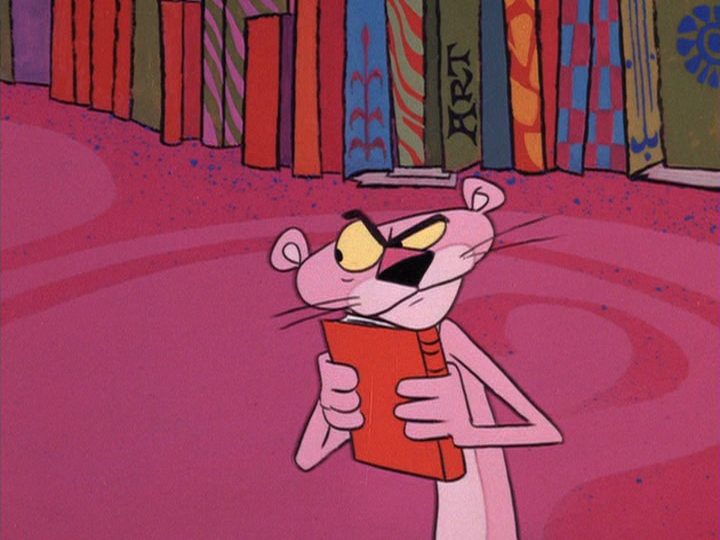 Out of the blue (Er.. pink), I had an urge to watch a VHS of “Pink Panther” cartoons. 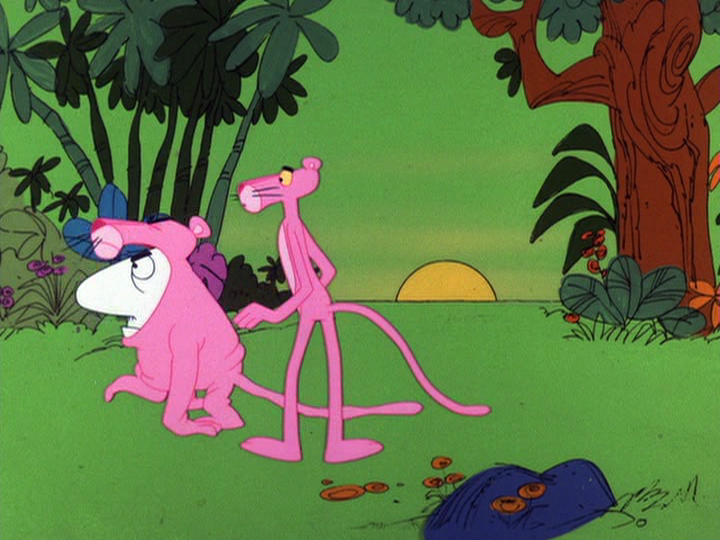 The first cartoon on the tape was, “Pink But Is It Mink” (1977). The ending was sweet where the Pink Panther holds a pair of scissors as he witnesses a disgruntled Tarzan wearing the fur, which he already cut out of his drapes. Then he walks off with his animal friends. It made me wish how at the end of the hectic school day, I could disperse into the wildness. There were interstitials in between the cartoons, one skit that I frequently watched was where, the Pink Panther was a high diving champion performing on an ocean cruise. During the Panther’s first dive, after a series of fanciful flips, he embraces the chilly water, only to instantaneously return on the diving platform. The Panther attempts to forgo his dive, until the captain with baton forces him to continue. During his final attempt – he has mysteriously landed in the sea. Doug Goodwin composed fun music that would correspond with the mirth in these in between cartoon gags. The backgrounds in the DePatie-Freleng cartoons do not replicate that of Warner Bros. or Disney, instead they were successful in creating their own style. When one views the backgrounds, it creates a sensual feeling. You can feel the texture of the surroundings as you watch. In “Psst Pink” (1971), director Art Davis, experimented with having the other characters painted sold white over the colorful backgrounds. It adds to the feeling of isolation between the Panther and the others. 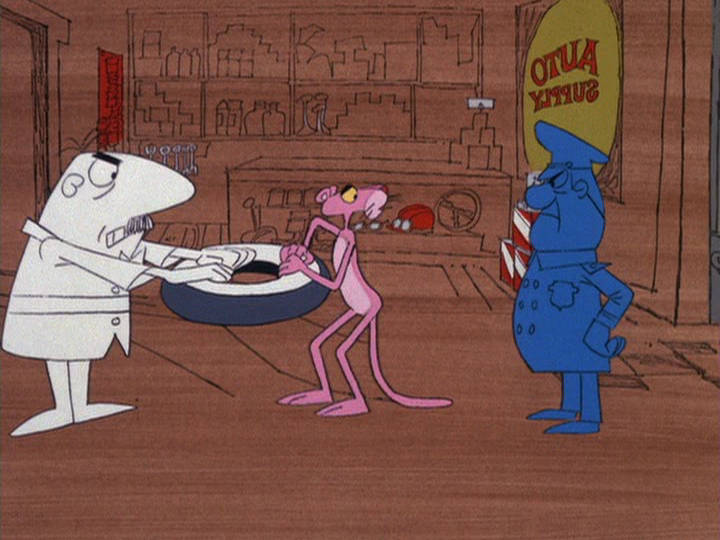 My reintroduction to the Pink Panther was when I was thirteen. I finally understood the subtle adult references that I would have missed when I was younger. 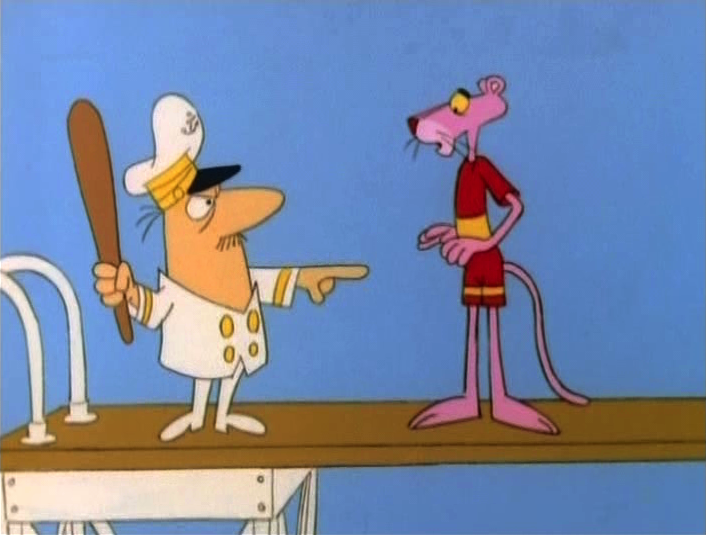 Immediately I could recognize that the Pink Panther cartoons were more sophisticated than other contemporary cartoons. As witnessed in “Psychedelic Pink” (1967), a Beatnik hands the Panther a book, entitled “The Love Life of a Panther” with the word Uncensored underneath. I was intrigued at how a risqué reference was incorporated. The Pink Panther’s shifty reaction after he glances at the title of the book enhanced the scene. The backgrounds depict hearts and flowers surrounded by swirling colors. The final scene stood out where the Panther uses the letter “j” as a golf club, and the Beatnik using the letter “f” as a firearm. It seemed as if this gag was a precursor to the animated segments on “Sesame Street”, where letters are used as objects. When I watched the Pink Panther at an earlier age, I expected that he would talk but to my surprise he was silent. To me the notion of a silent cartoon character was absurd. Now I began to appreciate the brilliance of telling a story without dialogue. The Pink Panther shorts relied on the pantomime actions of the character in order to facilitate the story. As David DePatie explained “Ordinarily a lot of his characterization could be taken care of with a voice, but now it all has to be done in action – so he’s a much more difficult type of character to work with” In a pantomime cartoon series there is difficulty to advance a story without voices, however that is where the imagination of writer John W. Dunn, shone through. In “Rock A Bye Pinky” (1966), the dog is held responsible for the Panther’s backfired attempts of silencing the little white man’s snoring. 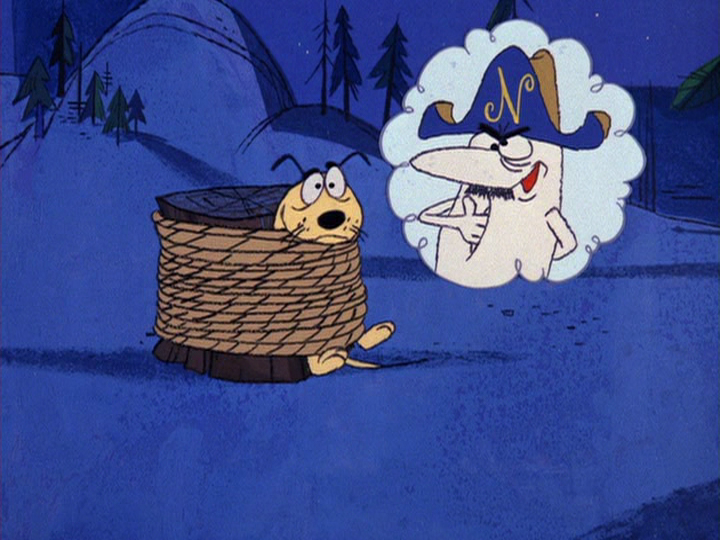 The relationship between the dog and his master has reached extreme distrust, where the little white man while sleeping holds a pistol aimed for his dog who is tied to a tree stump. The dog questions the sanity of his owner by picturing him as Napoleon. A similar set-up is seen in “Pink Campaign” (1975). The Pink Panther relaxes in his tree house, until the Little White Man cuts it down. As an act of retaliation the Panther follows the little white man to his residence, and starts stealing his house from him piece by piece. The little white man visits a psychiatrist to confirm the sudden disappearance of his house. The psychiatrist holds a stethoscope over the patient’s head to reveal a speech bubble showing the roof walking, followed by the window, etc. This absurd gag elicited tears of laughter from me. The aforementioned scenarios would fall flat if they were to verbalize their thoughts. I was lured by the effectiveness of director Hawley Pratt’s drawing ability: You could instantaneously sense the emotion the character was feeling. The old saying “A picture is worth a thousand words,” was applied in "Pink Posies"(1967), after the Little White Man discovers that the yellow flowers he’s planted is pink. He is very frustrated. You can detect the rage the Little White Man feels by the aggravated expression, the position of his arms, and his jagged teeth. As a companion to the Pink Panther, theatrical shorts was a French detective, The Inspector, who was loosely based on Peter Seller’s Inspector Clouseau. While both The Inspector and his live action counterpart differ in their approach in crime investigation, namely the former is prone to bad judgment while the later is inept. There is no denying the wrath that both Commissioner Dreyfus and his counterpart have for either Inspector. The series employed Henry Mancini’s lavish theme used in the title for A SHOT IN THE DARK (1965) aptly fit. Adding to the beauty of the shorts, was Tom Yakutis sensational layouts. One feels as if you have been walking in the breathtaking locales (France, Switzerland) the cartoon took place in. Pat Harrington Jr. provided a light French cadence for the Inspector and Sgt. Duex-Deux. Occasionally he would lapse into Peter Seller’s habit of mispronunciation of certain words. Paul Frees performance of the Commissioner reverberated the fierce ferocity, and the authoritativeness - the traits best associated with him. Of the Inspector shorts that were on there, my favorites were “That’s No Lady That’s Notre Dame”. In an attempt of catching a purse-snatcher, the Inspector surreptitiously cross-dresses, however, the Commissioner mistakes him for a woman - his sister. The Inspector too embarrassed to reveal himself to the Commissioner, he accompanies the Commissioner for dinner. Eventual they meet in the Commissioner’s apartment where they encounter his wife who has a headache. Another short that I liked was "Unsafe and Seine" that sent the Inspector and Sergeant Deux-Deux on an excursion upon receiving notice that his life was in peril. In the beginning, the Commissioner responds in an equally booming voice "Lower your voice when you yell at me, when the Inspector reveals how the secret agent may be unethical delighted me, because I liked how assertive he was rather than complying with his superior. The calamities that both him and Duex-Duex were victim to was amusing. The first destination was a seedy bar, Le Slit Gullet. A ravishing woman wearing a décolletage flirting with Sgt. Deux-Deux was appealing due to the stunning design of her and the seductive voice provided by June Foray. It made me realize how these cartoons were intended for adults. The Inspector upon seeing how much adoration Sgt. Duex-Duex was receiving literaly turned green with jealousy. I enjoyed how Pat Harington Jr. as the Inspector rather hushed, but nuanced delivery of the line "May I remind you are on duty, Sergeant". The utterance of Sergeant caused a huge uproar in the dives sending weapons chasing after Inspector and Duex-Duex. 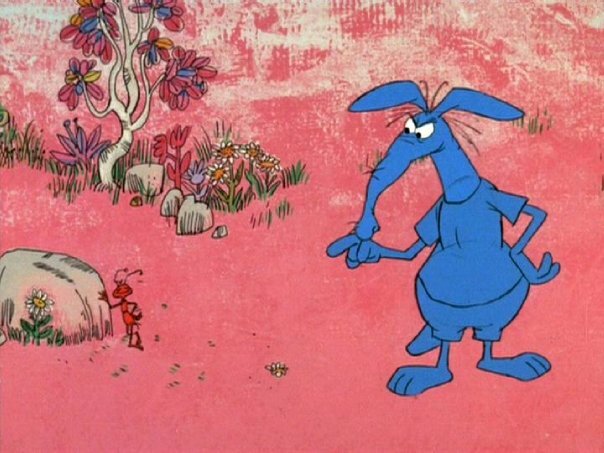 In addition to the Pink Panther cartoons on that tape there were a supporting series, "The Ant and The Aardvark", which featured a laid back ant named Charlie, and an aardvark who wants to eat him. At Warner Bros. Friz Freleng had directed the Sylvester and Tweety cartoons; It would be natural that Friz’s earlier work at Warner Bros. would permeate through the “Ant and The Aardvark” series. John W. Dunn and the other writers assisted in devising or reworking gags that seemed inspired. “The Ant and The Aardvark” seemed to me a fresh change of pace from the other predator vs. prey animated cartoons. Comedian John Byner did an excellent job delivering the lines as both the Ant and his nemesis. The Aardvark rattling off his witticisms to the audience during his unsuccessful attempts of capturing the Ant was entertaining. When I had viewed cartoons where Sylvester would attempt to capture Tweety, he would not divulge his plans to the audience. I thought having the character breaking the fourth wall made all the difference. The voices for both characters perfectly suited their personality. The enthusiasm of watching the series had trickled into my school work. Composer Doug Goodwin created the lingering Dixieland music that perfectly accompanied the Aardvark catching the Ant. In gym class, when I played floor hockey, his music score for the series played in my mind as I dashed from area of the gymnasium to the other. The final cartoon “From Bed To Worse” (1971) was helpful in preparing me for a quiz in science. The Aardvark while whacking his cane on the dog’s leg cast, utters, "DON'T! BE! A! WISE! GUY!" When I saw that sequence for the first time I was in stitches laughing. It is brilliant how the Dog’s reaction is frozen during the whole moment. The Aardvark says to the audience “You know what? I think he’s dead.” The dog removes his blanket to reveal an alternate leg cast, which he uses to hit him with. 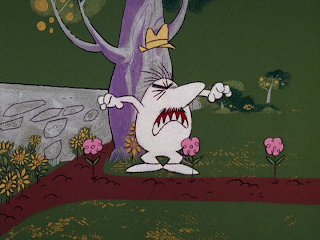 I suspect that it was Friz Freleng who may have timed out that sequence. I transferred the audio from several “Ant and The Aardvark” cartoons to an audiocassette. Late at night, I was listening to this cartoon while attempting to memorize the ranking of rocks on Mohs Scale of Hardness for a quiz the next day. The punctuated dialogue the Aardvark uttered as he was whacking the dog had a catchy rhythm. I attempted to recreate the delivery of how the Aardvark said each word as I recited the order of rocks: It was an extremely helpful method. I relished opportunities where I could connect my studies to my interests. 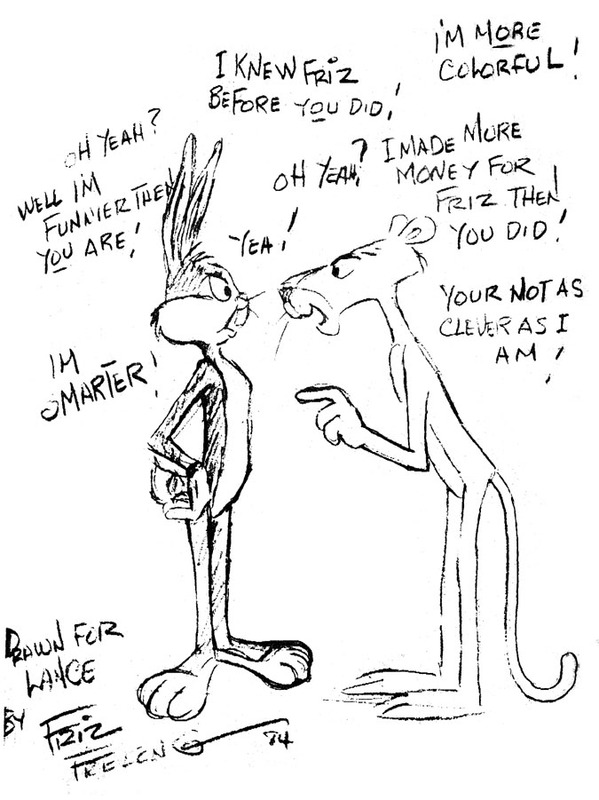 Fan drawing by Friz Freleng. 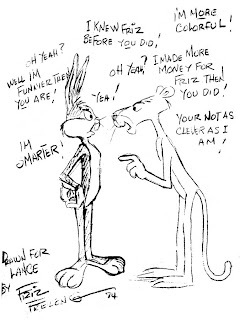 One of my dreams where Bugs Bunny interacted with the Pink Panther.